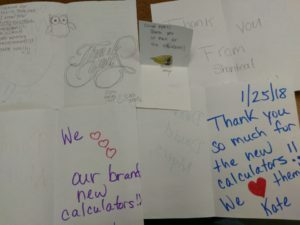 Dave Myers, President of JMS, recently provided a donation to help Ms. Simpson’s 10th grade class get new calculators for their math classes that would not be covered by Charlotte-Mecklenburg Schools. 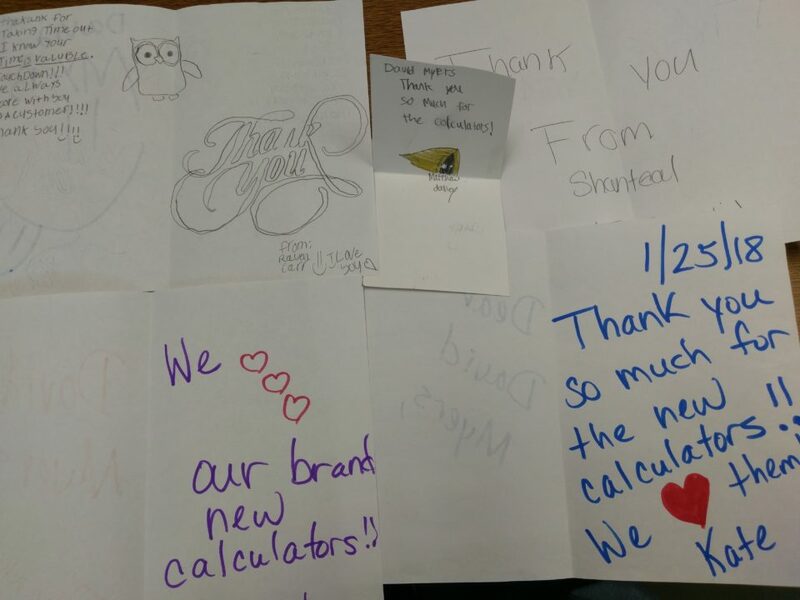 Students replied with personal letters of thanks. My students are very diverse and from various backgrounds. Our charter school is a Title I school. Unlike traditional public schools, charter schools receive no funding for buildings, equipment, campus improvements, or technology. Most of my students have not been successful in other schools and environments and are at risk for academic failure. Our vision is to help students become critical thinkers, effective communicators, engaged citizens, and life-long learners. Our charter school treats each individual the same no matter what disability or background a student comes from. Our students are a part of a big family with the staff and parents of our charter school. Thank you again for your donation!! Your Welcome! Hope your students enjoy them and get some great use out of them.